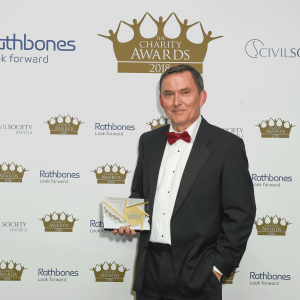 Kevin Curley, former chief executive of Navca and chair of Community Action Derby, has won the Daniel Phelan award for outstanding achievement at the Charity Awards. The award recognises an individual who has contributed throughout their life to the sector, by volunteering and making a contribution to the culture and vision of the sector. The award is given out by Civil Society Media in honour of its late founder, Daniel Phelan. Curley received the award last night from Cathy Phelan, Daniel’s wife, in a ceremony at the Pavilion at the Tower of London last night. Curley is best known in the sector for his role at Navca, the local infrastructure body, but he has a career of more than 40 years in the voluntary sector. He has held a number of leading roles at councils for voluntary service as well as at Headway, the brain injury charity. He has also worked extensively in Tanzania, including a position there with VSO. He remains involved in both areas, as chair of Community Action Derby, his local CVS, and as project officer of grant-giver the Tanzania Development Trust. In 2012 he received a CBE for services to the voluntary sector. Curley has continuously spoken out on the power of local community action, and for reform of the way charities are funded and supported at a local level. He said his work in the voluntary sector began in 1971 after he became involved in a survey of homeless people in York after the death of a homeless man in a shop doorway in November, which led to the opening of the city’s first night shelter just weeks later. A little later he worked to help refugees fleeing Idi Amin’s regime in Uganda. “Forty five years on we still struggle to meet the needs of people sleeping in our streets,” he said. “And we respond to people fleeing the latest tyrant or warlord in Syria, Eritrea or Somalia. Curley praised the importance of voluntary action in the charity sector. “The people who came forward in 1971 to help and those who come forward in 2018 display all that is best about local voluntary action in our communities. People whose values base impels them to take action when they see injustice, disadvantage and discrimination. Curley also called on the sector to protect its infrastructure. “Local support charities like York CVS and Community Action Derby are so vital,” he said. “They are having a very tough time right now. In some places they have closed down. “In other places they are no longer strong enough to take the leadership role I saw in York 50 years ago and that I see in Derby now. “So, if you agree with me, wherever you live and work, engage with your local CVS and help it to thrive. Because without it, local voluntary action and local volunteering cannot thrive. And both are vital if our communities are to be fairer, safer and more compassionate.